The red axe tribe had a goal: take over the desolated northern steppes. Armed with their mythic axes and strong in numbers, they waged war like there was no tomorrow. They fought without rest for months, and every victory brought them new warriors and slaves. Soon, they had conquered all but one last tribe. 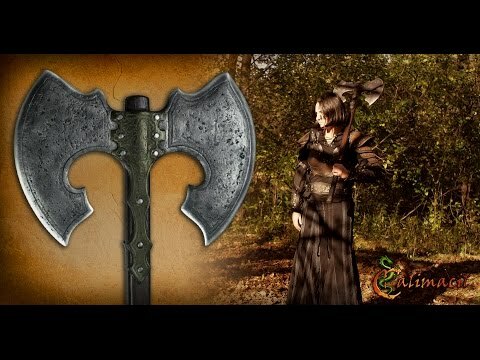 One tribe standing between them and their empire: the broken axe tribe. Never before this many axes were seen on the same battlefield. When victory came for the Orcs, they showed their supremacy by taking the sacred axe of their new subjects and merging it with theirs. By doing so, they created much more than an empire; they created a new and terrifying tool of destruction. The double axe. 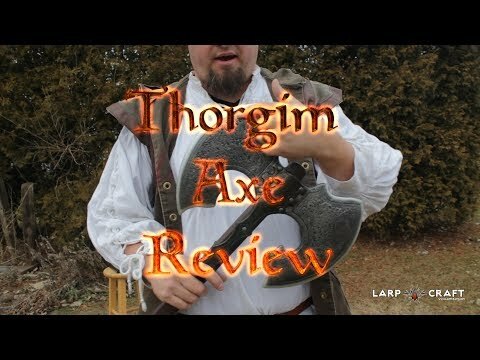 The head of this LARP double axe is incredibly realistic thanks to its steel colour and aged gold accents. Furthermore, the wooden handle ends with a perfect imitation of leather details. This enables a great handling in every situation. Entirely made of Calimacil foam, this axe is absolutely safe, and is durable enough to remain safe and enjoyable for years to come. Barbarians will naturally be drawn to this axe because of its brutal nature. They know that the only thing better than an axe is a double-headed axe. However, many evil creatures that dwell far away from civilisation may use this axe for its efficiency: Orcs, Goblins, even a few Trolls who learned “refined” techniques beyond crushing things with clubs.